For the hunter looking for performance and features the Hot Shot Bison has it all. 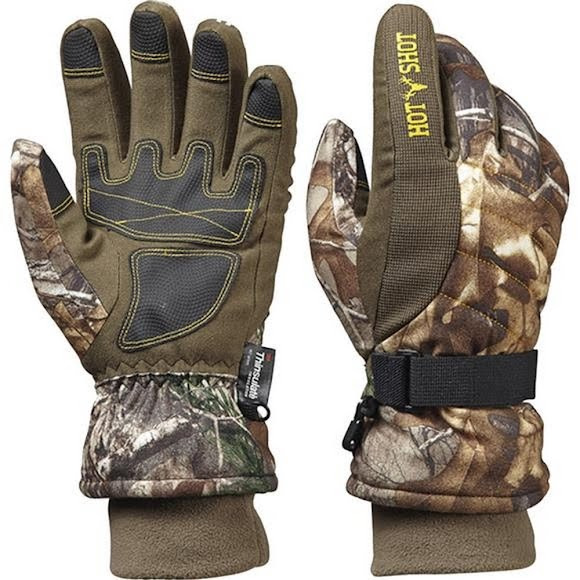 Features include a waterproof breathable insert, 80 grams of 3M™ Thinsulate™ Insulation, an adjustable wrist strap, a comfortable and soft fleece cuff, ODOR-X™ lining for enhanced scent protection, and strategically placed PU palm patches that increase durability without sacrificing dexterity. This fabric eliminates the bacteria that emit odor and alert wild game to your presence while allowing excess heat and moisture to escape. Odor-X provides enhanced scent elimination for added concealment while stalking trophy game. The Xtra in Realtree Xtra stands for extra effectiveness in the field. This new camo pattern blends perfectly year round in a variety of habitats. It blends best from the leaf change of fall through winter, then again in early spring before green-out. The versatile camo design includes tree trunks, large and small limbs, leaves of many types and colors, and large open areas.